On Thursday, November 8th, the Courier of Montgomery County featured Unlimited Care Cottage resident, retired Lt. Col. Leslie Thompson. The newspaper highlighted and honored the 100 year old veteran for his lifetime of service to this country. Thompson is proud to have served in World War II, the Korean War, as well as the Vietnam war. The article goes into depth about Thompson’s dedication and his background in the service. The centurion still practices patriotism daily and salutes the flag each morning upon waking. 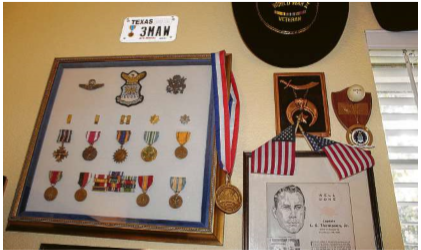 His daughter has a collection of his war memorabilia, complete with old newspaper clippings and pictures from the wars he served in. We learn how just before the start of World War II, it was recommended by his uncle that Thompson should sign up to serve our country in the military. He liked the idea and signed up for the Calvary. It didn’t take long before he approached his General and asked to be switched from riding horses to learning to fly. After passing a flight physical, he officially became a member of the Army Air Corps. He wound up flying the skies for 35 years, earning two Distinguished Flying Cross medals, along with many other awards (as shown in the picture). 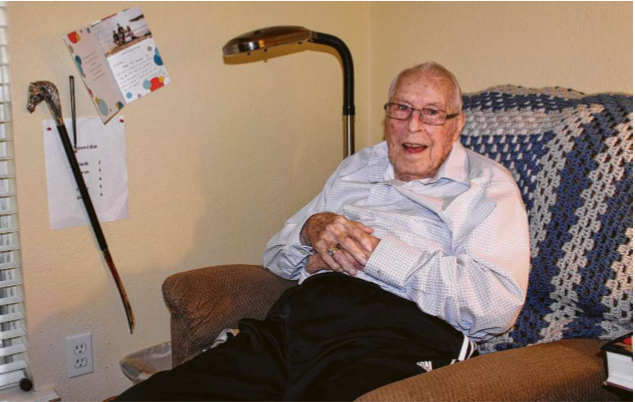 Lt. Col. Thompson turned 100 last month and currently resides at Unlimited Care Cottages in Spring, TX. He was pleased to receive birthday letters from Sen. Ted Cruz and Gov. Greg Abbott, congratulating him on his service and achievements. Although he says he is glad to have lived through all his experiences, he said he wouldn’t want to go through them again, and that “war was awful.” He reflected on his buddies planes being bombed by the Germans and losing two, three, or four planes a night to the bombs. Contact us to learn more about the assisted living community Lt. Col. Thompson stays at and also to enquire more about his time in service for our country.